Romney foreign policy speech: How can he praise the Marshall Plan while attacking the stimulus? 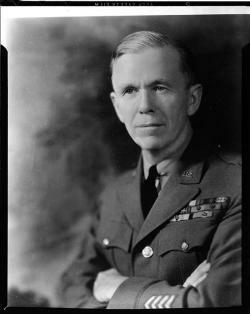 General George C. Marshall, chief of staff, in August 1940. U.S. Signal Corps/Library of Congress. Vapid Mitt Romney returned with a foreign policy speech that was all hat, no cattle. Behind the bellicose language hid nary a meaningful policy suggestion. It was merely a series of bromides, designed to make him look tougher than the incumbent. But here is an ironic twist. Gov. Romney repeatedly praised Gen. George Marshall—the former secretary of state and secretary of defense and a graduate of VMI, where Romney delivered his speech—for the vision, wisdom, and leadership that gave birth to the eponymous Marshall plan. We all know that the bold series of expenditures by the United States, $13 billion during the period from 1948 to 1951, and another $13 billion spent by the U.S. in direct aid to Europe between the end of the war and the initiation of the Marshall plan, rebuilt Western Europe. What was in total shambles at the end of the war became a vibrant and renewed economy that soon joined us in NATO and became, today, in aggregate, the largest economy in the world. Why is Romney’s praise for the Marshall Plan odd? What was the Marshall plan? It was the 2009 stimulus in a different name at a different time—and large enough to do the job. How can Mitt Romney praise the Marshall plan if he is so disdainful of the stimulus? If the Keynesianism of the Marshall plan was so necessary and brilliant, what was wrong with the same concept in 2009? The Marshall Plan was about 2 percent of our GDP. The stimulus, excluding the tax portion, was just a bit more. Given the $2 trillion dollars in economic output lost during the 2008 crisis, the $787 billion stimulus should have been even larger. Romney is smart enough to understand that just as the Marshall Plan was critical to the recovery of Europe, so too the stimulus was critical to our bouncing back from the depths of the 2008 economic crisis. If Romney had a better plan for what to do back then, I would sure love to hear it.